Wondering what Structured Negotiation, a Winning Alternative to Lawsuits is all about? The table of contents is posted here. My book is written for lawyers, law students, advocates, mediators, and anyone looking for a cost-effective, relationship-building, and win-win way to resolve legal claims. It is full of Structured Negotiation success stories about digital accessibility, disability rights and accessible technology issues. Check it out! You can buy the book on the website of the American Bar Association. Use code LFLEGAL for 10% off the list price. Want to know more? Read about the book and advanced praise for Structured Negotiation. Introduction: What Is Structured Negotiation? Does the Word “Discrimination” Encourage People to Do the Right Thing? Chapter 3: Is Structured Negotiation the Right Strategy? Chapter 4: Are Claimants Ready for an Alternative Process? What If a Negotiation Falls Apart? Getting Started: Term Sheet or Draft Agreement? This post contains the table of contents for Lainey Feingold’s book. 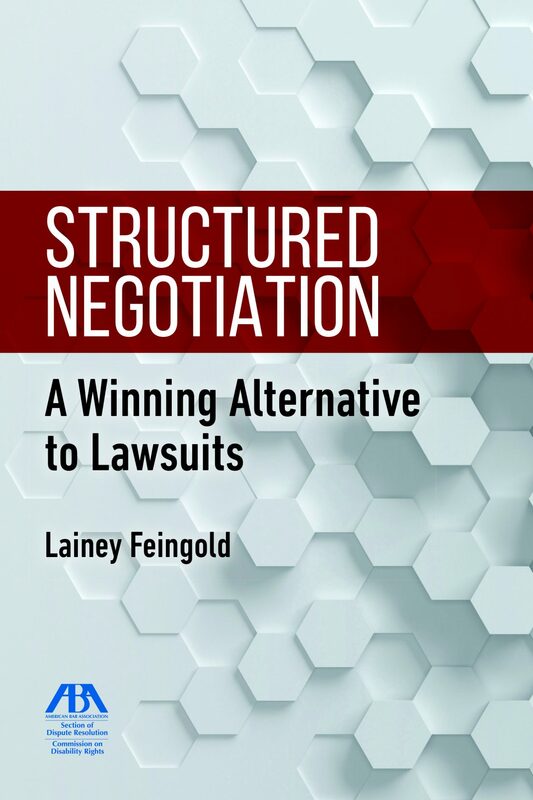 The book is about Structured Negotiation – a way to solve legal problems without filing lawsuits. The book is a roadmap through the process. Readers will learn how to write a letter, how to use positive language, and how to write a legal agreement. Once the agreement is negotiated, the book talks about media strategies and how to make sure the agreement works. The book is for lawyers and non-lawyers looking for a different way to resolve legal problems.